Most American consumers are likely completely unaware that well-known food chains and coffee brands like Panera, Peet’s, Pret, Keurig, Krispy Kreme, Caribou, Intelligentsia, and Stumptown are all owned by a single private German company, JAB Holding. But that may change now. 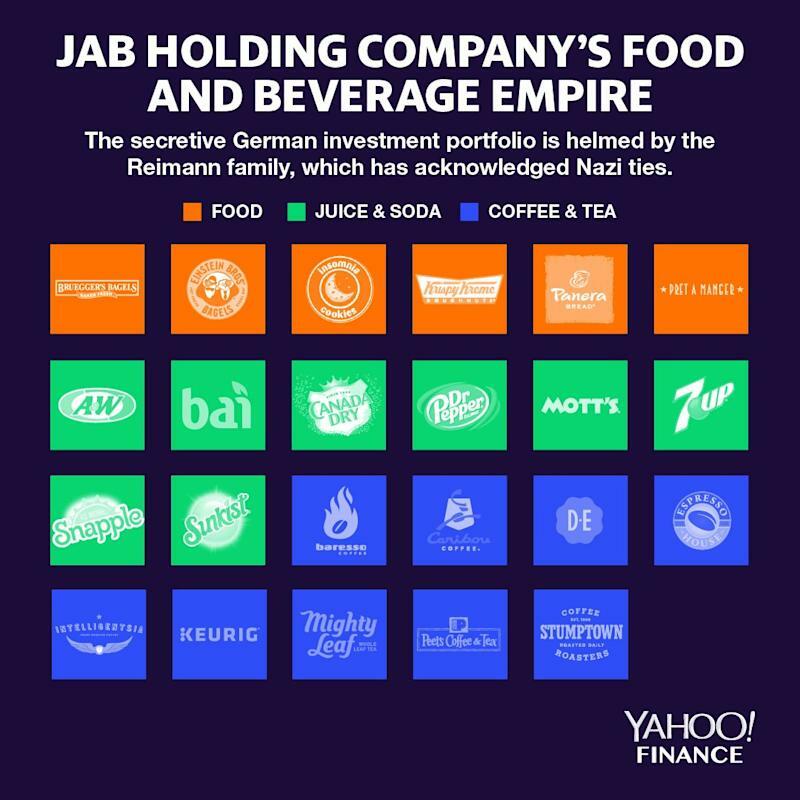 The family behind JAB, the Reimanns, is facing scrutiny for its Nazi past, after the German newspaper Bild reported that Albert Reimann Sr. and his son Albert Reimann Jr., both of whom are now deceased, had ties to the Third Reich. According to Bild, both men were fierce Hitler supporters and anti-Semites, donated to the SS military force, and used forced labor of French prisoners in their factories. In other words, the Reimann family fortune is rooted in the Nazi party. And that could put the brands in the JAB portfolio under the microscope like never before. The four family members who own and run JAB today are descendants of German chemist Ludwig Reimann. The company is named after Ludwig Reimann’s business partner and father-in-law, Johann Adam Benckiser. In the wake of the Bild report, the family is donating 10 million euros to a charity it has not named yet. The Reimanns also say they hired a historian in 2014 to investigate their ancestry, but the historian’s full report will not be finished until 2020. The business problem that now faces JAB’s many brands is whether consumers will show their disapproval with their dollars. The full list of brands in the JAB portfolio is eye-popping: Panera, Peet’s, Krispy Kreme, Keurig-Dr. Pepper, JDE, Caribou, Intelligentsia, Stumptown, Brueggers Bagels, Einstein Bros. Bagels, Noah’s New York Bagels, Espresso House, Insomnia Cookies, and cosmetics company Coty, which owns Calvin Klein, Clairol, Covergirl, OPI, Marc Jacobs and more. Of course, many companies that are household names today had well-documented ties to the Nazis during World War II or used forced labor, including Volkswagen, BMW, Bayer and Nestle. Yahoo Finance has begun reaching out to all of the JAB-owned brands to request comment on the report about the Reimanns, and will update this post. Daniel Roberts is a senior writer at Yahoo Finance who often covers food and coffee. Follow him on Twitter at @readDanwrite.